Immigration Center for Women and Children (ICWC) expanded their offices to include the San Diego area. For their December campaign, they wanted to gain public awareness of their services in the area starting with donations to jump start their exposure to include the San Diego office. For any nonprofit organization, December is an important month to generate donations and especially in the spirit of the holiday season, a non-profit is seen as a last minute write-off. Immigration Center for Women and Children (ICWC) expanded their offices to include the San Diego area. For their December campaign, they wanted to gain public awareness of their services in the area starting with donations to jump start their exposure to include the San Diego office. This email blast was one of two creatives that were designed. The corresponding email campaign, however, had the flexibility to be more emotive, and Heat Design Group settled on the theme “Give The Gift of Safety and Security” to show that everybody can donate to an important cause. The response rate exceeded ICWC’s expectations even after they realizing their customers extended beyond the traditional norms of donating. 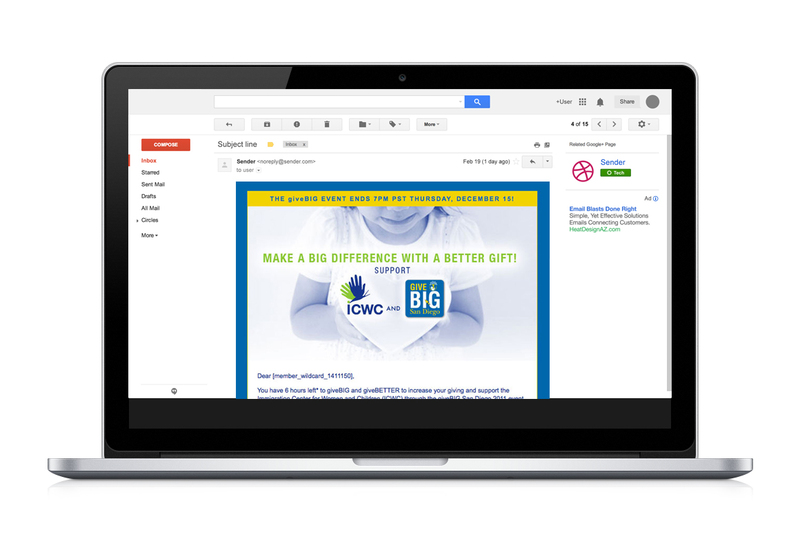 The styling of ICWC’s email blasts became a huge draw for many donors, generating increased donations, even long after the e-blast’s promotion was over that month.